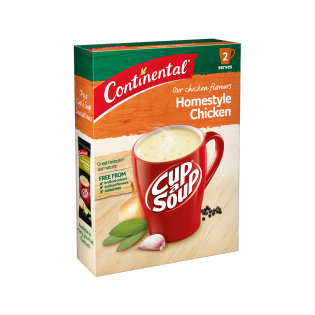 Enjoy a delicious Homestyle chicken soup with Continental's Cup-a-Soup Chicken dish. Learn how to create this delicious afternoon snack today. Maltodextrin, potato starch, creamer [vegetable oil (contains soybean), glucose syrup (from wheat), milk protein, mineral salts (339, 450)], salt, natural chicken flavours, mineral salt (potassium chloride), sugar, yeast extract, sunflower oil, chicken powder (1%), cream powder, onion powder, herbs (parsley, sage), spices (black pepper, celery seed), garlic powder, food acid (lactic), natural colour (turmeric). Contains naturally occurring glutamates. Allergens:Contains soybean,wheat and milk products. Made on equipment that also processes products containing peanut, egg, sesame, fish and crustacea. needs a stronger chicken flavour, the chicken teases you almost coming to realization and then disappears leaving you unsatisfied. If this is new - go back to the drawing board - i am trying it now as we speak - it is bland there is no chicken flavour it tastes like flour water and some kind of flavour that I cannot identify- but DEFINITELY not chicken. this is a great tasting soup, continental's best imho.